Toshiba 43U5863DB 43-Inch 4K TV is the cheapest 4K TV in the Amazon Prime Day 2018 UK sale (£280)… should you buy it? We’ve scoured EVERY 4K TV deal in the Amazon Prime Day 2018 sale, and have found the cheapest 4K set you can buy. 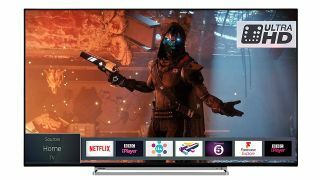 It’s the Toshiba 43U5863DB 43-Inch Smart 4K TV, it has HDR, it’s a smart TV, and - after an already generous discount yesterday to £299 - the price has just dropped again, to a ludicrous £280. That’s a saving of £89, which is pretty much a 25% reduction in price. Basically, the best TV offer we've found has just got even better. That’s a brilliant price for a proper 4K TV with HDR and all the features you’d expect. The question is: should you buy the Toshiba 43U5863DB as a 4K TV for gaming and for watching streaming services like Netflix? Or is it just a poor TV that Amazon is trying to shift because, er, no-one wants to buy it. Here’s our guide to the pros and cons of the TV, and whether or not it represents good value for money. The display itself is 4K ready, which means it’s capable of outputting at 3840x2160 pixels. It comes with Dolby Vision HDR too, which is considered to be the (slightly) superior version of HDR. The picture itself is a perfectly good 4K display, with decent blacks and a vivid colour range to rival almost all mid-range 4K sets. You could easily spend double the price on a rival 4K TV and not get noticeably sharper, more vibrant colours, which is a big advantage of this cheaper TV. You do miss out on refresh rate, which means pictures won’t be quite as smooth as more expensive sets, but that’s the main sacrifice you make for the price. Of course, this is only a 43 inch screen too, whereas most 4K TVs are 49 inches and above, so it’s better suited to a small room or as a secondary TV in the home. It’s an ideal gaming TV for anything other than super fast, high-resolution games - so you’re fine with the likes of God of War and FIFA, but it won’t show future titles like Spider-Man and Forza Horizon 4 at their optimum loveliness. You could easily describe the Toshiba 43U5863DB’s sound as perfectly fine. Most modern 4K panels sacrifice sound quality for picture, because serious TV users often supplement the in-built speakers with either soundbars, wireless speakers, or a good pair of headphones. The Toshiba’s sound is supplied by Onkyo, which is a respectable, if not market-leading, name in sound. The output is 20W, and you get Dolby Audio, so ok. Overall, you’re not getting a bargain when it comes to sound, but nor are you getting a duff product - it just is what it is. Again, if this is a secondary TV it’s 100% fine, but you may want to invest in a speaker system if this is your main unit. It’s a smart TV, so you get most of the popular apps built-in. Netflix is on there, as is BBC iPlayer, but the likes of Amazon Prime and Now TV are - ironically - not present on the TV. As you’re hooking this up to a PS4 or Xbox One, though, this doesn’t matter. If you have PS4 Pro or Xbox One X, you’ll be able to watch Netflix Ultra in 4K just fine, and access all the other services via your console. In fact, it’ll be better to do that, because the Toshiba 43U5863DB’s TV guide and interface isn’t the best, and is one of the TV’s biggest weaknesses. It just isn’t as streamlined or user friendly as the Samsung or Sony interfaces. Again, though, if this is a TV for gaming, that won’t matter much - you’ll be spending most of your time using PS4 or Xbox One’s user interfaces. The overall build quality is good, for a cheaper 4K TV, and you get a decent number of HDMI and other inputs to hook up all your additional tech. There are 3x HDMI ports, 2x USB ports, an Audio Optical input, and a bunch of other ports. Finally, it says that this TV is compatible with Alexa, meaning you can control it with your voice if you own an Echo or Echo Dot. It does indeed work, but setting it all up is very tricky, and many users have complained about how tough it is to get working properly. The functionality is there, but it’s not the best set to use the feature. Overall, yes, if you’re looking for a 4K TV and have a budget of £300 maximum, then this is a genuine bargain. Whereas it won’t out-perform comparable Samsung or Panasonic TVs, you get a lot of quality for your money, and you’ll pay £150-300 less for this. The main caveats are that you need to supplement the sound, if you’re looking to make this your main TV, and you should definitely stick to streaming apps via your games consoles rather than running them through the TV itself. This is great value.